Chances are you’ll never face an active attacker situation. However if you do, you need to be prepared. 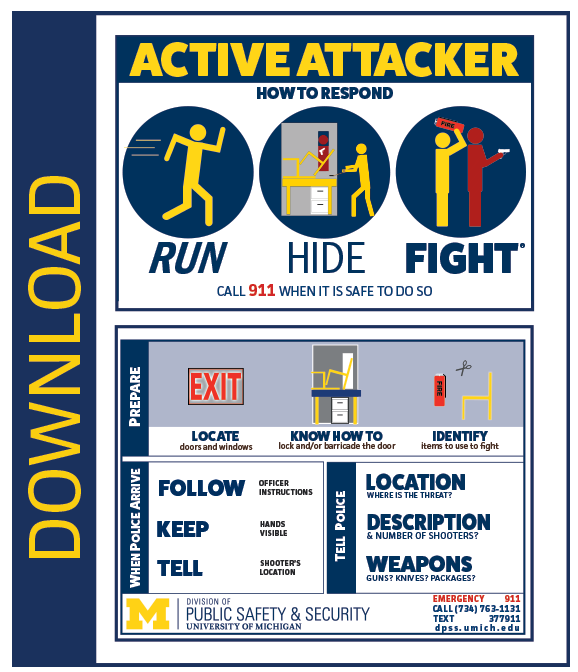 An active attacker situation can cause panic and disbelief. Knowing what to do in advance increases your chances of surviving. Your reaction matters. An "active attacker" is defined as "an individual actively engaged in killing or attempting to kill people in a conﬁned and populated area." (This is the agreed definition, according to multiple US government agencies, including the White House, US Department of Justice, FBI, DHS, etc.). In most cases, active shooters use firearms and there is no pattern or method to their selection of victims. Remember these three words—RUN, HIDE, FIGHT—these actions may save your life or the lives of others. 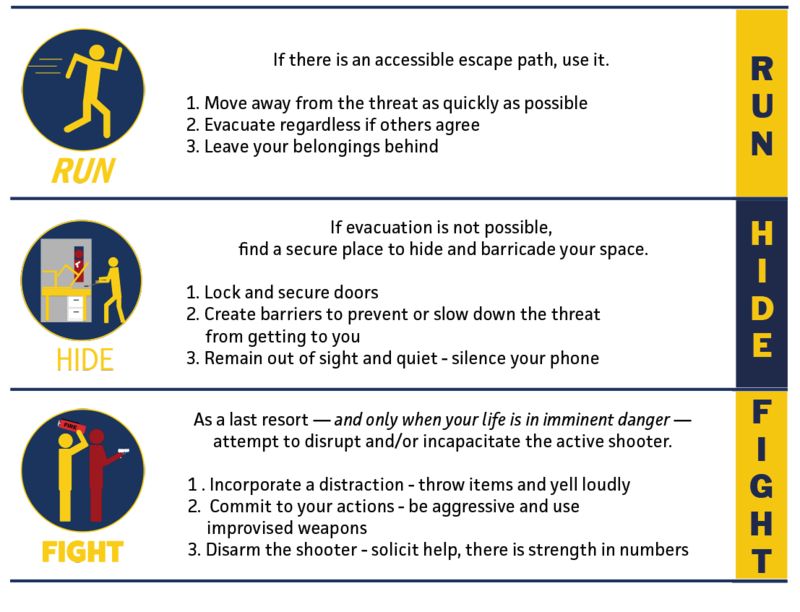 Police officers responding to an active attacker are trained to proceed immediately to the area in which shots were last heard in order to stop the shooting as quickly as possible and create a safe environment for medical assistance to be brought in to aid the injured. The responding officers may be in teams dressed in normal patrol uniforms, or they may be wearing external ballistic vests and other tactical gear. Expect to see different uniforms or officers in civilian clothes because officers will be deployed from different departments. How you respond to an active attacker will be dictated by the specific circumstances of the encounter. In addition, many in our community may need to respond differently as a result of a disability, caregiver relationship, leadership role, unique workspace location, or a variety of other reasons. Please contact us to discuss any specific concerns you may have. Always remember your options: RUN, HIDE or FIGHT. Stay informed by signing up for UM Emergency Alerts. You also may contact the Community Outreach Unit if you have additional questions or would like an officer to speak to your department, class or group. 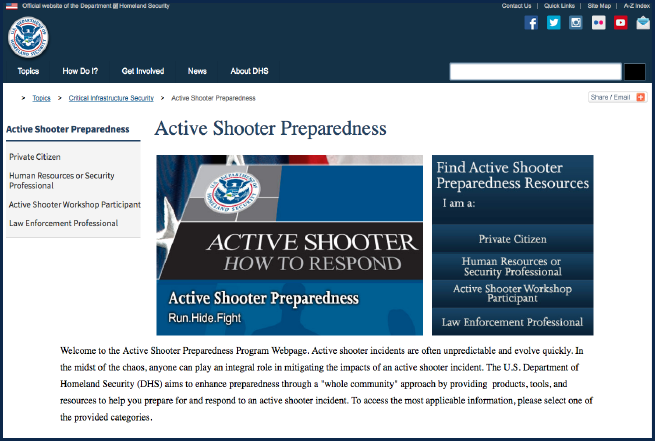 The U.S. Department of Homeland Security Active Shooter Preparedness website aims to enhance preparedness by providing products, tools and resources to help you prepare for and respond to an active shooter incident. This video was created by the City of Houston’s Office of Public Safety and Homeland Security using funds from the Department of Homeland Security. Please be aware that this video is designed to educate the public on surviving an active shooter event. The video contains graphic images of a violent shooter situation.